By now we're sure you've heard the news that the legendary Stan Lee has passed away at the age of 95. The Marvel editor-in-chief, writer and publisher was the co-creator of several of the biggest comic characters, including Spider-Man, X-Men and Fantastic Four to name but a few. 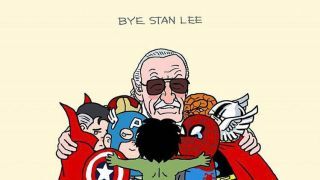 In light of the news, artists have taken to social media to share their thoughts of the great man via art, stories and web comics. With his warm personality and sheer enthusiasm for comics, Lee became one of the most admired and respected names in the industry. His cameo appearances in the Marvel films were a highlight of each release, and his importance in the history of comics cannot be overstated. Lee's passing leaves a huge hole at the heart of the world of comics. With the man and his creations having touched the lives of millions, it comes as no surprise that social media has been overflowing with tributes. Using the hashtags #StanLee, #StanLeeRIP and #StanLeeForever, Twitter has been flooded with artwork as users pay their respects. Actors, writers and editors have also lined up to remember Lee and his monumental impact – here are some of the messages that tugged at our heart-strings. With so many people sharing the artistic tributes, it can be hard to know where they came from. If you know the source of any of these amazing illustrations, please let us know.